This “Flood Survivor Friday” item is truly a miracle. I had many items in bins, but water still managed to seep in and ruin most everything. My Wonder Woman daughter Kristina was up to her knees in muddy water on Day Two of the clean-up process, right before a crew of at least eight workers was expected to arrive. I was upstairs and suddenly heard a scream. Not a scary scream, but a happy one. MOM!!! YOU WON’T BELIEVE WHAT I FOUND!!! Kristina and I lifted out all the books and one by one, flipped through the pages. Dry as a bone. These were the two contests I competed in, contests #32 and #34. Kristina also competed twice, the first time at Bake-Off #35 when she was just barely 12-years-old and in 6th grade. Kristina won $2,000 for her Raspberry-Filled Apricot Cake, and a refrigerator. In that same contest, my mother also competed and she won her category and $10,000 for Creamy Broccoli and Wild Rice Soup! It was the first time in Bake-Off history that a grandmother-granddaughter competed and both won prize money. Kristina still holds the record for the youngest money-winner in Bake-Off history. That was quite a contest, to say the least. 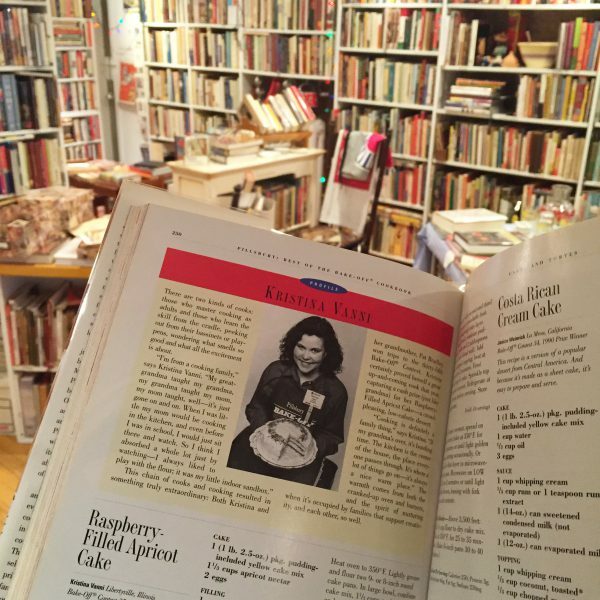 The picture above was taken in New York City about a year ago at Bonnie Slotnick’s Cookbook store where we found the Pillsbury book that featured past winners. I had this book in my collection but now I will have to replace it. 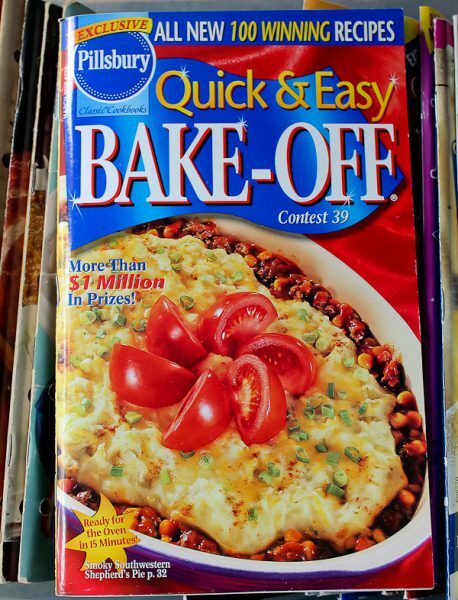 Kristina’s 2nd Bake-Off was #39 and her recipe for Smoky Southwestern Shepherd’s Pie was featured on the cover! She was also one of the contestants selected to be featured inside the book. The official rules to enter the 48th Pillsbury Bake-Off will be coming up in October and this time is going to be coupled with the Food Network. Check it out! Maybe a Doughboy miracle could happen to you too! I was with you in #34! Isn’t that where we met? 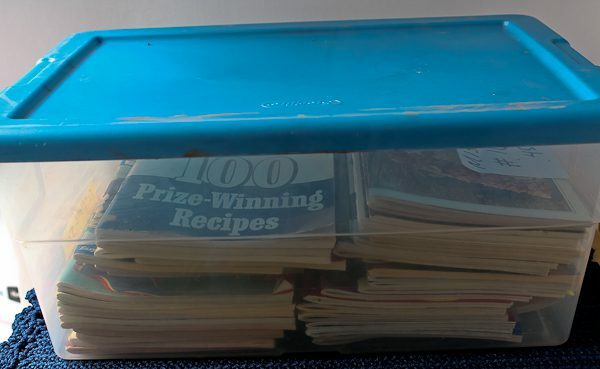 I’m so happy that most of your treasured Bake Off books were saved! They are such a part of baking history, and I know each of them is very special to you. And it’s so wonderful that your mom, you and Kristina were all in the Bake Off!!!!! 3 generations! I love it!!!!! My Bake Off books are very special to me too. At the age of 20, in 1975 I was at Bake Off 26 with my Ham and Cheese Crescent Snacks. 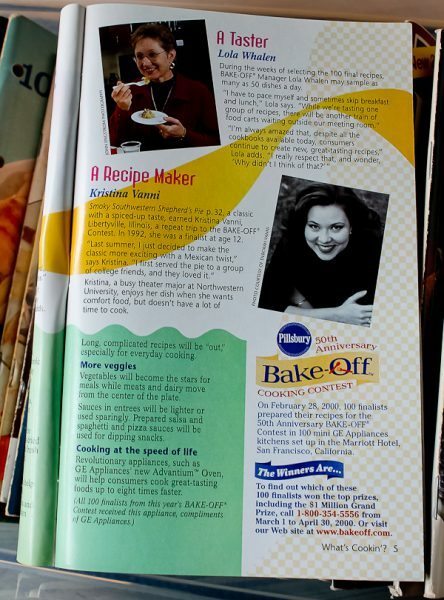 That recipe got me into the Pillsbury Hall of Fame so I was at Bake Off 39 in 2000 with Kristina and I received an award for that. Then I won my category with my Choco Peanut Butter Cups at Bake Off 42 in 2006. Great memories!!!!! I think you are a Bake-Off superstar, Ronna! Thank you so much for sharing this latest news! 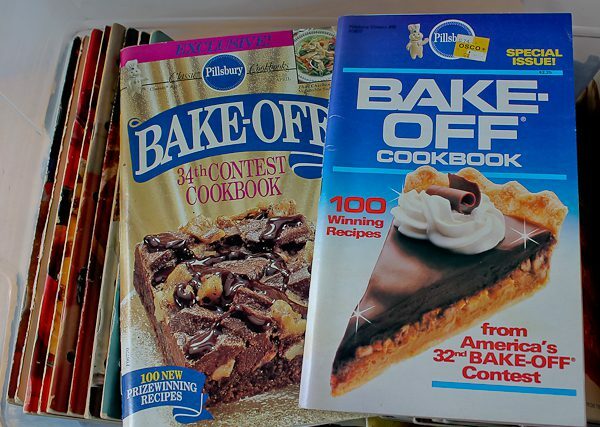 I’m really happy that Kristina found these treasured Bake Off recipe books! You have more for your Culinary Cellar! We were so happy she found them too. If the workers had found that bin, they would have assumed it was water-filled like the rest and tossed it. Kristina saved many items singlehandedly. She was my hero! Miracles never cease! 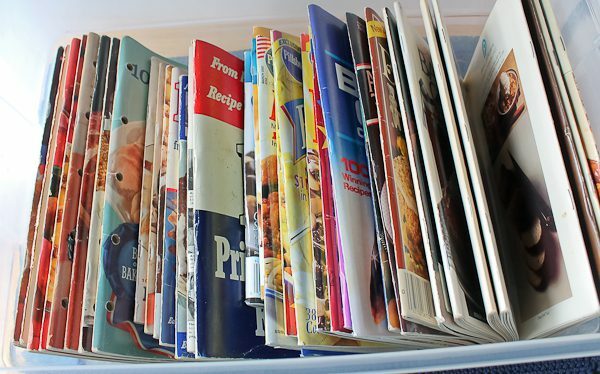 So glad they made it through the flood since they truly hold some wonderful memories, not to mention all those great recipes.